So it's the day after, and your turkey is digesting, or digested. So let's talk about giving thanks. So often in our culture thanksgiving comes down to me thanking God for making my life more comfortable. Thank you, God, for my house, family, food, cars, bank account, freedom, church, safety. Thank you that the lady in the VW pulled out just as I wheeled into the parking lot so I got that choice parking spot. It's about me and what I define as good in my life. What if we gave thanks instead for God and what he defines as good? This would quickly become a much more biblical view of giving thanks. In the Bible, especially in the book of Acts which is a template for Jesus-followers both individually and corporately, you will almost never find people thanking God for (or making a priority of) their own comfort. They are caught up in God's priorities and viewing reality from God's perspective. What is God's priority? Getting the word out about Jesus' resurrection and the new era that has dawned because of his victory over sin, death, and hell. So Peter, Paul and the rest see that which serves to get the good news of Jesus out as good, and that which hinders the spreading of that word as bad. So, for example, in Acts 5 Peter and John rejoice that they have been counted worthy to receive wounds for the name of Jesus. They pray not for protection but for boldness to continue speaking in the face of danger. I don't think there's anything wrong with praying for protection, just like I don't think there's anything wrong with a three year old praying that there will be ice cream for dessert. For an immature child, that is an appropriate prayer. For a mature adult to pray for ice cream, however, would be pathetic and self-centered. If I pray for protection, it says that I believe God has nothing more important going on than keeping the four wheels of my vehicle in the proper lane, on dry pavement. If I am caught up in the purposes of God and sold out for his goals, it's his job to protect me if that best serves his interests. We may indeed come to the place as we grow in maturity where we recognize that my suffering, or the frustration of my own desires, may well serve God's agenda better than my comfort. This is how we come to biblical thanksgiving, in which it is entirely appropriate for James, Paul, and the rest of the Bible's writers to encourage us to give thanks for our sufferings. These writers had lived through enough trials to recognize that God works in our suffering for both our good and for the advancement of his goals. As I suffer as a follower of Jesus, my character is formed and shaped to be more like him, and my suffering becomes a tool God uses -- both short term and long term, to spread the news about Jesus to others. 1. the gift of freedom in this country has not only given rise to a plethora of churches and amazing creativity in ministry, but also to widespread complacency and immaturity in the church -- so maybe it's at best a mixed blessing. 2. the gift of turkey, sweet potatoes, pumpkin pie with whipped cream, cranberry sauce, mashed potatoes, and no pressing engagements after supper so we all lay on recliners in the living room is contributing to an ongoing pattern of weight gain, indolence, and self-satisfaction that may get in the way of God getting the word about Jesus out to people, so maybe we need to rethink our prayers of thanksgiving. 3. the lady pulling out of the parking place at that precise moment so I could walk less than fifty feet to the door for the amazing in-store door-buster specials the day after thanksgiving robbed me of the opportunity to stretch my legs and work off a few more calories I'd ingested the day before. You get the picture? Maybe we're not as blessed as we think we are; maybe we're just self-indulgent so we see every consumable we receive as a blessing from God. God may want to lead us in a totally different direction, but our stomachs and our souls are so full we can't begin to sense the movement of his Spirit. That's why fasting is a spiritual discipline, and why it's appropriate for us to give thanks when our stomach growls. Culturally it's a little weird but biblically it makes perfect sense. I took a class in seminary called "Constructive Theology" -- the idea being that students should figure out what they believed and how to communicate it. One assignment was to write up your theology and distribute it to the class for comment and critique. Instead of writing an intellectual discourse I wrote a narrative, a story, partly because I believe that theology is usually best in narrative form. If you click on the link "Hillside Reflections" to the right, you can read what I wrote for that class. It's only fair to tell you that comments and critiques were widely mixed. Feel free to share your thoughts! This business of wounds and serving others out of our own healed wounds is critically important for anyone who is called to do any kind of ministry (therefore, all Jesus-followers). Many years ago Henri Nouwen wrote The Wounded Healer, a marvelous little book that deals specifically with this topic. 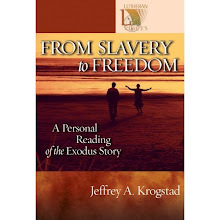 This idea was also at the root of my book on the Exodus (see picture at right -- click on it to go to the Amazon site). The adventure of writing that book was a struggle with transparency. "How much of this story am I willing to tell?" Not just about the big hurts, but about the little ones that are so often much easier to sweep under the carpet. As I wrote the book, I often wondered what people would think of me when they wrote it. For example, I love hunting, especially bowhunting. But I have not been a successful bowhunter in terms of taking deer or other big game. In fact, at the time I wrote the book, I had never taken a deer with my bow. In the company of other hunters, would I be diminished if I admitted this in such a public way? It worried me. But it was true, and so I wrote it into the book. Actually, I wrote many such details about my life into the book, and in the course of editing, most of them were cut out. I nurtured a secret hope that my editor would insist on cutting the business about bowhunting -- she was not a very outdoors person -- but for some reason she found the story poignant and meaningful and she kept it in. In the end, the book became transformative for me, if for no one else. The process of writing down my own journey through difficulties, through pain, from the slavery of old hurts to the freedom of God's gracious love, was a powerful process for me. I faced another similar challenge the first time I taught a class on the book, because it felt like now, two years after writing it, I would end up dredging it all up again. But God knows his stuff, and healing comes not only as we reveal ourselves to others, but also as we begin to work in those wounds and give others the freedom to see who we truly are behind our masks. By the way, I think it is a gift of God (and not without some amazing irony) that, the fall of 2008, a few months after this book was finished -- it was written in the winter of 2007-2008 -- I sat on a deer stand shaking like a leaf, working through target panic and buck fever and all the rest, to make the shot that ended in me recovering my first deer taken by archery. I received that experience as God's concrete example that transparency brings a new level of healing. Following up the last post -- I heard an interesting speaker not long ago who talked about how Christians need to be more transparent about their wounds. He acknowledged how difficult it is to share something that's hurt you, especially if it's a situation where your own actions led to the hurt -- mistakes you made, failures, addictions are not fun things to talk about. But consider the alternative. So often we hide our hurts and camouflage our wounds. We paste on a smiley face and answer "Fine!" when anyone asks how we're doing. Sometimes we even hide our woundedness from ourselves. We skim along on the surface, not realizing that we are mortally wounded, not letting anyone else into the deeper corners of our existence. There's a subtle -- and not-so-subtle -- social pressure that encourages this behavior. We glorify the people who seem to have it together. We look at the ones who aren't visibly hurting, who are successful, who seem to be living victoriously over all life's circumstances, and we think that they way to be like them is to shellac the surface of our lives so everything at least looks shiny and new, even if there may be dry rot under the surface. We fill our lives with images of what we think are the beautiful people, and because living with wounds is unpleasant, we assume that being "beautiful" means they're not wounded. We willfully ignore the stories we've heard time and again of the deep brokenness in the lives of those who carry this "beautiful" image. Remember Marilyn Monroe? Remember all those like her who have made their image their stock in trade, but who deep down writhe in pain, almost unable to function. We invest so much in imitating these images. What if we invested as much effort in dealing with our wounds? What if we paid as much attention to our character as to our faces? The way of Jesus is different. Those who follow him must learn to follow his example. Remember after Jesus was raised from the dead, when he appeared to the disciples but Thomas wasn't there? When Thomas heard about it, he said, "Unless I see in his hands the mark of the nails, and place my finger into the mark of the nails, and place my hand into his side, I will never believe." So when Jesus showed up again, and Thomas was there, Jesus said to Thomas, "Put your finger here, and see my hands; and put out your hand, and place it in my side. Do not disbelieve, but believe." (See John 20.) Jesus invites Thomas into his wounds. Jesus shows off the scars, invites Thomas to touch the places of woundedness. It is through Jesus sharing his wounds that Thomas is healed. Are you willing to talk to Jesus about your hurts? Are you willing to let him into those places to make changes? Are you willing to allow another person -- someone who knows Jesus, someone God's Spirit guides you to -- to know those wounds as well? What you may find surprising is that as you allow Jesus into those wounds, he brings healing -- and then, not in the middle of your misery but as he brings healing, those old scars become the touch point that allows you to have an impact in the lives of others. A surprising thing happened. After about three days in the Boundary Waters, my hip didn't hurt at all. I carried packs and canoes (sometimes both at the same time), climbed rock faces and trees, paddled on calm water and in some gorgeous windstorm conditions which resulted in my daughter, my dog, and me swamping and swimming the canoe back into shore. It was a joyous trip. When we got home, I made a mental note that if the opportunity presented itself, exercise might be good for my hip. But I didn't do much about it, and after a couple weeks of little activity my hip was back to its old unpleasant self. I hobbled along until early September when I went bear hunting. Carrying heavy loads through brush and over logs to get to our baits, walking miles upon miles -- would I be able to handle it? After a couple days, my hip quit being an issue and I promptly forgot about it. But when I got home, exercise went out the window again. I started easing up and avoiding physical activities that might hurt. Lately I realized that if I don't get some regular exercise, old age will win sooner rather than later. I have too many more canoe trips and hunting trips I want to take to give in just yet. So I started running at the YMCA. First day was tough, but it's getting easier. And I'm able to do physical activities that would have had me wincing in pain a short time ago. My point is not to give you a run down on my physical ailments. I've made enough hospital visits to understand how uncomfortable that is on the receiving end! But I think there's a spiritual parallel here. How often do we avoid topics and activities that are painful for us on an emotional level? Our emotions are closely related, though not identical to, our spiritual lives. When we shy away from emotional pain, we most often atrophy spiritually. When we dig into the painful areas, we grow stronger by leaps and bounds. The corollary to this truth is that it is most often the places of emotional pain that become the biggest road blocks to our spiritual growth. So ask yourself -- what hurts? What are the places of emotional or relational pain for you? Difficult memories? Areas of insecurity? Places of fear and anxiety? What relationships, what beliefs, are at the root of those painful things? Then take those to Jesus in prayer -- lay them out before him (he already knows them better than you do, but this is important for you to do.) Ask him to help you see, to help you understand, to help you heal. Keep going back to these areas until you can begin to talk to another trusted Jesus-follower about them. Then do that. You will soon find that the things that have held you captive are not nearly so strong as they once were. But if you shy away from these areas, they will remain painful and debilitating. Truth is, this is why so many people shy away from Jesus -- he doesn't let us off the hook of our wounds. Rather, it is through our wounds that he wants to bring healing to the world. Why should this surprise us? Doesn't the Bible say, "By his stripes we are healed?" I like to study. I love learning new things, figuring things out, finding solutions to complex problems. One of my great joys is to discover -- either through studying with others or through my own pondering -- a conceptual model that makes sense of the world in a new way. Once a friend described me as an "architect of ideas." I was quite taken with the phrase, because that captures one of the things I love to do. In some ways, I think this love of mine is a reflection of the western Church. Christianity in the western world loves to spin ideas. Even our basic theology -- creation, sin, incarnation, redemption -- is simply a conceptual formula that makes sense of the world. As a theologian I can sit back and read CNN and understand the news stories I read based on this simple dogmatic formula. Of course people will act in depraved ways -- they are sinners. No surprise. Of course from time to time there will be a bright spot, a story of humanitarian goodness. God is at work to redeem creation. My conceptual model makes sense, and I like that. But observing the world is not the essence of Christianity. The church in the western world too often piously, passively observes while the world goes to hell. We are called not to knowledge, but to obedience. Imagine if we were called to knowledge. The story of Jesus calling the first disciples would be very different. It might read something like this: "And as he walked along the seashore, he found Peter and his brother Andrew and James and John, the sons of Zebedee, mending their nets. And Jesus sat down with them and spoke unto them, saying, 'I am the incarnation of the third person of the trinity, one God existing in three persons. My nature is both 100% human and 100% divine. I was born of the virgin Mary through the miraculous intervention of the Holy Spirit. Shortly I will die at the hands of the Romans to achieve your vicarious atonement. Here's a handout summarizing these points.' "
Jesus never said anything like that. He did quite a bit of teaching, but his teaching moved people toward a choice -- either obedience to him or toward rejection of him. The simple call he extended to Peter and Andrew, James and John, was "Follow me, and I will teach you to fish for people." Their journey with Jesus started with obedience, not with knowledge. In fact, knowledge most often follows obedience -- obedience rarely follows knowledge. Fact is, far too many church-goers are caught in the trap of thinking, "If only I knew a little more ..." We excuse ourselves from obedience because of our lack of knowledge. Dietrich Bonhoeffer said that action springs not from reflection but from readiness for responsibility. In other words, our lack of obedience might very well reflect a lack of maturity, and this will be remedied not by more knowledge. Central's ministry staff recently listened to a speaker who related the story of telling his young daughter to clean her room. What if, the speaker said, she had gone away and came back saying, "Dad, my friends and I sat around and talked at great length about your command to clean my room. In fact, we made up discussion questions and had a great conversation. We translated your command into Greek and studied the meaning of each of the words." Do you suppose this father would be happy with his daughter's actions? I doubt it! So how do you begin to obey? It starts not with the grand scheme of earth-shattering obedience, but with the simple task God has laid in front of you. What is the tiny task that God set before you that you have not yet obeyed? Is it to take out the garbage? To read your Bible? To show affection to your spouse? To pray for a few minutes a day? To lead a small group? To donate a bag of groceries to a food shelf? To give a tenth of your income to God? If you are racking your brains and not thinking of what God has asked of you, either you are living an exemplary life or you're not paying attention. So here are a couple suggestions. First, Central has a partnership with two congregations in Njombe, Tanzania. Recently a member of our congregation spent a month there interviewing 384 children -- mostly orphans -- who cannot afford the cost of education. Central is seeking sponsors for each of these children. For less than the cost of a soda pop each day, we can provide a generation of one community's children with a good education. Structures have been carefully set up to avoid corruption and make sure that 100% of your dollars go to the education of these children. Central and the Southern Diocese of the Evangelical Lutheran Church of Tanzania are covering administrative costs. These are not the starving kids with flies on their lips you've seen on TV. Instead, these are kids who have lost parents, who spend most of their time in subsistence living, who dream of being doctors or teachers or lawyers or truck drivers but who can't afford the education that will open these doors for them. Click on this link to Central's website and follow the sponsorship links. You can sign up right online. If you can't afford $30 a month, you can sign up to give $15, $10, or even $5 a month. We'll group you together with others who are giving so that together, you can sponsor a child. Second, we're looking for people to commit to praying for Central at a specific time each day as a way to support the mission of Making Jesus Known. If you're willing to commit to prayer for Central at a specific time each day (I encouraged my daughter to do it while she's brushing her teeth) email me and let me know, and we'll put you on our list of pray-ers. It's not a matter of knowing enough -- it's a matter of being ready to take responsibility. Maybe one of these two options is God's call to you, or maybe there's something else God has placed right in front of you. Will you obey? The wind came up this afternoon outside my office. I'm looking out my window at a bush that was transplanted late this summer. It's so new the tag from the nursery is still attached to one of the branches. As the wind gusts, the tag goes horizontal, flapping and vibrating in the wind, faster than my eye can follow. It makes me wonder. The Bible compares the Spirit of God to the wind (see John 3, for example). In fact, in both Hebrew and Greek, the word for "spirit" and "wind" and "breath" are identical. (We do a similar thing with "respiration" and "inspiration" -- same root, both from the term for breath and spirit.) So if the wind is the Spirit, the bush is the world -- like in 1 John 2:15-17 -- and the little piece of paper is me. Frequently I think God wants to move me from here to there, to catch me up in the wind and fly my life like a kite. The Spirit blowing around me moves me, swings me up and down, around and around, and I can almost let go -- but there are strings that tie my heart to the things of this world and keep me from flying. John says there are three elements to this: the desire of the flesh, the desire of the eyes, and the pride in riches. The desire of the flesh is any self-centered impulse that keeps me rooted to myself and my desire rather than focused on Jesus and willing to fly free on the wind of his Spirit. Lately the desire of my flesh has revolved around a new shotgun. There's a place and a time when buying a shotgun could be fine, even God-pleasing, I think. But my tendency to obsess about the shotgun I have not bought, to miss God-given opportunities around me because I'm thinking modified choke or full choke, 12-or-20-gauge, synthetic or wood stock, pump or over/under, etc., etc., etc. -- this is the desire of the flesh that pushes love for God out of my life. So often we think of sexual matters when we hear a phrase like "desires of the flesh" -- and that may be accurate at times. But the desires of the flesh go far beyond sexual cravings into all kinds of self-absorbed desires. The desire of the eyes is more momentary but equally dangerous. If you saw the movie "Up" you know what "Squirrel!" means -- it means the distracting visual that takes your focus off what it's supposed to be. It's the shiny thing, the image in the catalog or the magazine or the computer screen that, when you see it, has the power to create desire in your heart. It might be a shotgun, a beautiful house, a purse, or a less-than-fully-clothed woman. What it is isn't the point. The point is that the desire of the eyes is a quick way to get our focus off the things of God and onto our desire for self-indulgence. We are vulnerable to visual stimulation -- or else why has advertising become a multi-billion dollar color photo industry? "Pride in riches" is maybe a narrow translation. Other translations say "the pride of life" or "being too proud of what we have" or even "wanting to appear important." Looking at the Greek, the word for pride carries the sense of arrogance -- this isn't being proud of your children's achievements, this is knowing you're better than your neighbors. And literally in Greek, it's "pride of life." William Barclay translates the phrase, "life's empty pride." He says of this man, "His conversation is a continual boasting about things which he does not possess and all his life is spent in an attempt to impress everyone he meets with his own non-existent importance." Barclay goes on: "The man who attaches himself to the world's aims and the world's ways is giving his life to things which literally have no future. All these things are passing away and none has any permanency. But the man who has taken God as the centre of his life has given himself to the things which last forever. The man of the world is doomed to disappointment; the man of God is certain of lasting joy." Lord Jesus, cut the strings that tie me to this world -- not the world that you love, that you came to redeem, but the world that stands opposed to your lordship in my life. Curb and kill my desires for anything other than you. Blow me away on the wind of your Spirit so that my spirit might soar with you! Then reconnect my heart to this world as your' heart is attached to it. Let me be one who loves it with your love, who serves the world in your name. Change my heart to your image, Lord. Amen. The church is most effective when it does ordinary things with gospel intentionality. Think about that. Your life as a Christian (assuming for the moment that you are one -- if you're not, just play along for the moment) is most effective when you are together with other Christians (this is after all how we define the church -- Jesus' followers together), doing ordinary things -- grocery shopping, mowing lawn, driving, baking a hotdish ("casserole" for those of you from the Twin Cities and other places out of touch with rural life), washing dishes, writing an email, playing backyard football, or whatever ordinary things you find to do -- because Jesus Christ became human, died on the cross, and rose from the dead. Two mistakes we believe about this. First, we believe that Christian actions are somehow different than ordinary actions. So our activity has to be specifically Christian -- reading the Bible, say, or praying, or sitting in a sanctuary or working in a soup kitchen. Second mistake we make about this is that we believe we are called to do just ordinary things, but we do them for ourselves, without any sense of gospel intentionality. So I drink my coffee by myself while I read a novel because it's kind of a self-indulgent habit that I've gotten into. Or you bake a casserole ("hotdish" for you backcountry rural types like me) because you need something to eat for supper tonight and you're kind of grumbly and upset the whole time because you resent something about the task. In short, we do ordinary things but we do them self-centeredly. Doing ordinary things together with gospel intentionality. So sitting around with a group of people barbecuing hamburgers and soaking up the sunshine can be church if we are mindful in our get-together that we are together for one and only one reason -- we are together because of Jesus. Suddenly this self-indulgent backyard gathering becomes church, and it becomes a unique kind of church that might have the potential to change the life of some poor soul who gets invited in. (Inviting, by the way, is also a very ordinary activity that can and should and must be done with gospel intentionality.) The gathering doesn't change the person's life because you all gang up on him and ask, "Have you heard of Jesus?" Instead, as you enjoy being together in Jesus' presence with your backyard friends, he observes your care for each other and says, "See how they love one another!" and decides that he would like to be part of this community. This desire continues even after the paper plates are thrown in the garbage and one of the group gets teary when she describes a particularly challenging place in her life and the rest of the group takes a minute to pray for her, right there in the backyard. Poor Soul now is really intrigued and thinks, "These people are doing ordinary things together with gospel intentionality; I must return and investigate." Do you see how easy -- and how hard -- being church is? It is just doing ordinary things together, but it is doing things together with gospel intentionality. It is letting Jesus and his people invade every detail of our lives, every activity of our days. I was recently invited into the foyer of a friend's house and we stood there to visit for a while. We didn't talk about anything terribly spiritual; we compared notes on a ministry we share, but most of the conversation was catching up on what is going on in their lives, decisions they're facing, and what's going on in mine. But I walked out the door a few minutes later feeling distinctly lifted, like I had been at church. And I had. This weekend I was deer hunting at the farm where I grew up. Part of hunting deer is walking out in the woods after dark or before daylight. I love doing this. Sunday night we were on a difficult blood trail. We started tracking after dark and spent an hour bent over with lights, examining dry leaves, looking for tiny spots of blood. The trail curved and wandered, twisted and meandered. Fixed on the trail, we did not worry about directions or the easiest route back to the truck. Instead, we followed wherever the trail led. When the blood ended -- just stopped -- we were far into the woods. We searched for a half hour, sometimes on hands and knees, sometimes bent double over the earth, but couldn't find another drop of blood or another distinctive track. We marked the spot, knowing we would return again the next morning. Now, how to get out? There were no direction markers, no arrows pointing to the nearest exit, no lighted walkways. We could easily wander in circles for hours before finding the edge of the trees, and then we might find ourselves on the far side of the forest from the truck. We turned off our artificial lights and stood for a long time in the dark. Eventually our eyes adjusted to the blackness and we could look up through the trees and puzzling among the branches, we finally made out Cassiopeia, Draco, and Ursa Minor, with brilliant Polaris on his tail. Using the North Star as our guide, we struck a straight path to the edge of the woods, walking carefully through the tangle of brush and thorns. In a very short time we emerged into the dark alfalfa field to find the world mantled with a gorgeous wrap of open sky and bright stars. We had new wounds -- cuts and scratches on hands and faces. The world is not a gentle place. I'm not against programs, but I think the western church has gotten WAY too dependent on them. It is a rare program that actually launches people into the Christ-following life. One of the things I love about Alpha is that people deal with each other in their small groups, and in their conversations they are ACTIVE, not passive, and they begin over the course of ten weeks to take ownership of their own faith. Some of them, at least, begin to move from passivity to action, from customer to missionary. One of the biggest challenges with leading Alpha is to help people transition from "I really like our small group" to seeing this new Jesus-centered life as exactly that -- a life, a lifestyle, a way of living. A major focus in my work right now is to develop a way for people to come out of Alpha (or other programs) and step into an active, ongoing, relational community that follows Jesus together. That's why I enjoy the book Total Church so much. It describes a life that is not just studying about Christianity, it is living it. That's exactly what we need more in the church today. A thought about customers vs. missionaries. This is obvious after some thought, but in the daily grind of church staffing and leadership, we often miss the obvious. Think about it. If I'm a pastor (that's the rumor, anyway) and I decide to lead a Bible study, or a parenting class, or any of a dozen other kinds of programmatic opportunities, I have created an opportunity for people to come consume the product I'm offering. I have knowledge and they come to receive. I have expertise and they come for education. It's only slightly different if I facilitate a course taught on video. At that point, Dave Ramsey or Rick Warren or some other phenomenal teacher has expertise. By offering this kind of program at my church, I encourage people to be customers. This breeds passivity and dependence. The ultimate example of this kind of dependence that I've ever seen -- I accepted a call to a church once and during my first month there, discovered that a couple gifted leaders were offering the Crossways Bible Study. I was hugely excited because I know this to be excellent material that helps people develop sound biblical knowledge. I was a little taken aback when i discovered that they had taught the class six times, and the same ten people had taken the class each time. When I said, "Wow! You guys must know this material by now -- we could have ten different classes with each of you leading one!" They looked horrified and said quickly, "Oh, no -- we don't know the material nearly well enough for that! We need to learn more." They were passive customers. Occasionally we need to offer programs to give people basic training or information. Once in a while this is appropriate. But fact is, all the programming in the world won't help people love God more or serve their neighbor better. To grow into this stuff -- to grow into what Jesus said was the most important -- we need to start doing it, preferably doing it with others who are at varying places in following Jesus. Dietrich Bonhoeffer said (and I think he hit this one out of the park) that obedience does not come from knowledge, it comes from readiness for responsibility. 3. We hide our fear behind the excuse of "needing to know more" before we act. Jesus didn't act in any of these three ways. He said to the incompetent fishermen, the despised tax collector, and many others, "Come, follow me." Then he started walking. We only know the stories of the ones who left their baggage and followed. Just read a thought-provoking article that has me asking hard questions. When you come to church, do you come like a customer or like a missionary? Customers are looking for a good deal, looking to buy a quality product for not too high an investment. They want to get something that will make their life better. The customer leaves church asking, "What did I get out of that?" Customers go church-shopping and hope to find a church with good programs for their kids, an active youth group, upbeat sermons and dynamic worship. Theology that matches their own so they don't have to be offended very often. A young (but not too young) pastor who won't bore them or challenge them too much in his (possibly her, depending on the customer) sermons, which should be about 1/3 of a 60-minute worship service. Make no mistake, these customers know what they want and they are discerning shoppers. Missionaries don't go to church this way at all. Missionaries come in out of the storm looking for shelter. They've often been beaten up by the world a bit. They have a critical task to do in the kingdom of God, and worship for them is a respite, a breather, a huddle with others who share the kingdom but have their own tasks. Missionaries are hoping for a word and a meal that will get them the next few steps down the road that Jesus is walking with them. They know who they are and who they belong to, but they live and work and follow Jesus in a world that lies to them, so they need to come together with other believers to hear the truth, to breathe easy for a while, to be refreshed for the next leg of the journey. Missionaries rarely complain about the quality of the coffee or the color of the carpet, because they have seen God doing his best work in some places where there is neither coffee nor carpet. The missionary leaves worship saying, "Oh, thank you, Lord ... now back to work." What would the church be like if it was a fellowship of missionaries? I think that's exactly, precisely what Jesus intended it to be. This is the church Jesus foresaw when he said, "the gates of hell will not stand against it." This is a church on offense, a church released from worship each week to wreak havoc on Satan's kingdom, a church that pulls dying people out of death and darkness, into the light. This is a church of people who volunteer at food shelves, work in public schools, bring cookies to a new neighbor, stop for the lady with the steaming radiator, help coach the football team, shovel the other guy's car out after the snowstorm, donate money to support other missionaries, sponsor the orphan, sit by the bedside of the sick and dying, have the hard conversation, pray and read the Bible with their children, help the stranger move across town, and so much more. This is a church that doesn't worry about opinion polls or personalities. It's a church that is chronically short on money because it's giving so much away. It's a church that is more effective scattered, and it gathers to enjoy fellowship and worship together. The church the world loves to criticize, the one that is full of hypocrites, the church that is "a hiding place for weak people," as one perceptive young woman told me, is generally speaking a church full of customers. The missionary church flies under the world's radar. The missionary church is rarely caught up in theological arguments, and then only when something critical to its mission is at stake. Sad to say, most of the churches I've ever been involved with have been mostly customer churches. But the missionaries are there, maybe ten percent of the population, like yeast in the dough, like salt in the food, just enough to make it worthwhile to stay. They give me hope.